Direct and to the point is the advice from The Wildwood this week. This makes things, interesting. I drew this card via the app on my Nexus 7, primarily because the cards are then safe from the prying paws of my toddler daughter. 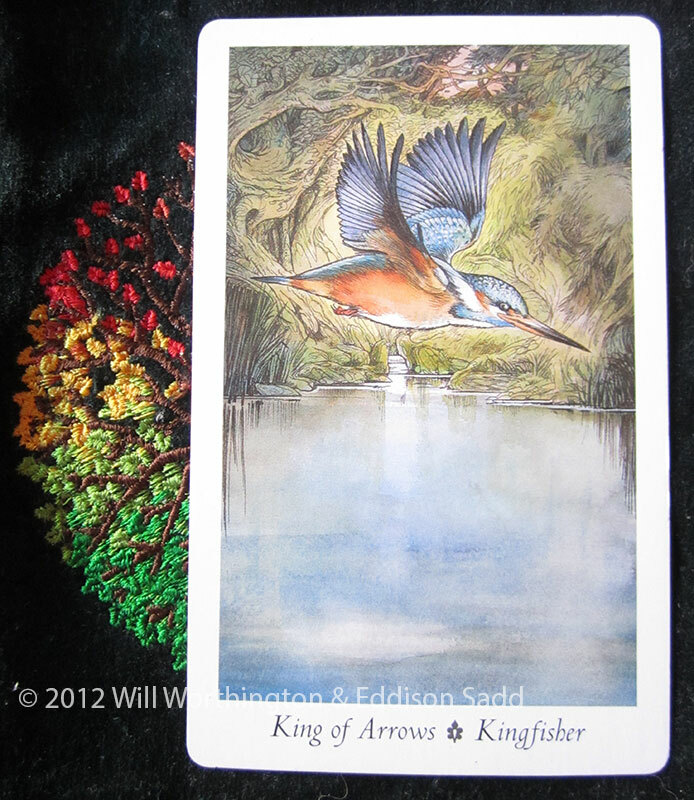 However, I didn’t expect to pull out the Kingfisher, aka, King of Arrows. This little bird is rare, I’ve never seen one with my own eyes, but the drawings that Will has done for this deck is just amazing! It’s like a photograph I wished I’d taken. That said, this little feather friend is at home in the water catching fish as it is in the air. It’s an ancient symbol of wisdom. They strike when the time is right, so they’re good judges of when to strike, what power to use and sheer force of will. Go your own way by Fleetwood Mac just came into my head with this card. This King is impartial and will help you see things clearly. So, what are you holding onto that you no longer need? Lets be direct here with the self answers; come on, let it go. Use that inner strength to cut the bonds that bind you, that hold you back, weigh you down. Find your calm in the chaos of life, be watchful but be prepared to be the counsel for others. They’ll appreciate your calm take on things and in doing so, you’ll likely pass your calm onto them. From a place of calmness, anything is possible and everything is probable. I hope I’m this calm this week, that I’m able to offer advice and spot the truth from the false, though with three kids around me, that’s certainly not always easy and certainly not my strongest point! Still, I have the chance to work at being calm and direct this week, so, let’s get started, shall we? What wise words could you impart? How do you make people think? What needs your clear direct focus this week? What is true and what is false? Can you make others see a different perspective this coming week? Do you need my services to counter or add your own? I’ve used The Wildwood Tarot and a single card draw for this blog post, which I’d love if you liked and shared it around Social Media! Best thing to do is ask for help! 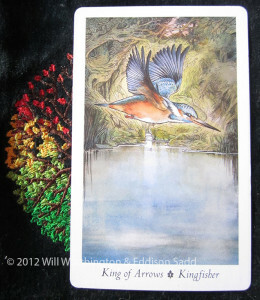 The Kingfisher is good at being calm and logical. Not my usual trait either.